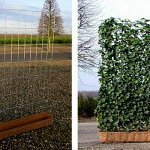 With vertical gardening and greenery it is easy to hide unsightly walls or create scenic fences. With the proper care and maintenance, these plants even protect the walls and actively participate in reducing the heat loss of the building. When you select the plant species for a wall or fence landscape design project, your choice should be determined by the light direction and the exposure of the object. The plants designed for a vertical gardening are more likely to grow faster. They require a 40-50cm think soil fertile. Most plants require an extensive care and supplementation. 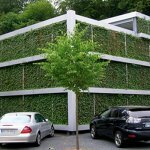 For creating a vertical colored walls, or as they are often called “vertical gardens”, there are few prior construction requirements that provides a certain conditions for the planted vegetation. Once the special construction is done, a special geotextile fabric is being laid on the surface. Covered with ornamental and flowering plants, this layer creates the basic vertical garden. The main purpose of vertical gardens is to compensate in a short time the shortage of green spaces. In addition, it decorates the facades, protecting the inside of the buildings from dust and noise. The Live Panel is an innovative system, tailored to solve the problems related to the construction of vertical living walls. Live Panel is a modular design that easily fits into the environment. The modular system consists of insulation panels filled with specifically developed substrate that gives the plants the needed nutrients to grow normally. The panels are mounted on walls or buildings through aluminum profiles. The system has a built-in irrigation technology that supports the substrate and keeps it constantly wet. The substrate is characterized by its excellent water retention. The small residual water is collected by gutters and can be used when is needed. The mobility of the Live Panel allows unlimited aesthetic possibilities. It can be used for both exterior and for interior landscaping, for making logos, or color accent. Nothing’s impossible with the right selection of plants and professional execution. 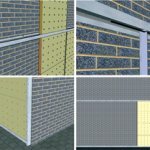 Easy installation around windows and doors. The Green Screen is an essential element of the system WallPlanter. For the Green Screen system, 3 genus of plants are being used: Fagus, Carpinus and Hedera. The plants are planted in specifically developed soil substrate and are grown on steel grids. Planted in the ground side by side, the Green Screen panels create safe and attractive evergreen or seasonal hedges. It is possible for an attractive wooden or steel chests to be planted. This will create a separate design area. 100cm x 100cm, 155cm x 120cm. Additional height can be achieved if necessary. Wall Planter is a system for construction of living walls, by which is achieved an immediate visual effect, unlike the previously known methods for the vertical planting. It can be mounted on both new and existing buildings and walls. The system was to be made of aluminum boxes, in which are planted fully mature remontants, growing on high quality steel mesh. The individual needs of the plant, such as water and nutrients, are supplied via an automated watering system. ТThe system weight (chest, network, plant) – 1250kg, 1450kg in damp soil. This is a completely new course, influencing the Bulgarian landscape architecture. The most familiar to the public is the roof landscaping. 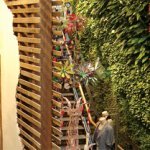 There are also several other courses, such as vertical greenery, vertical flower walls and others. There is a great need of specific planting. The good practices in other countries show fantastic results when a specific greenery has been used. That way the empty areas are more likely to be utilized. The effect on the urban environment is great and brings variety and life in places where it is impossible to use a traditional planting techniques.